The news that Altan was working on a recording of symphonic arrangements was met with some trepidation by Fiddlefreak. After all, traditional Irish music always seems to sound best in its native habitat… a pub, a kitchen, or a dance hall. Singer/fiddler Mairead Ni Mhaonaigh admits, “Ireland isn’t known for its opera or classical music. What we are known for is our traditional music, our language, our culture. That’s what we can give the world.” That and U2. 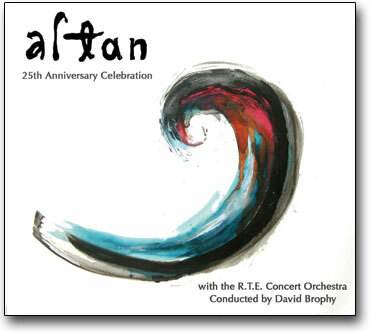 But my fears were ungrounded, as my ears met with pleasant surprise on “Altan: 25th Anniversary Celebration” (Compass Records). This is a sampling of 15 best-of songs and tunes from their previous releases, with orchestral arrangements by Fiachara Trench and performed by the RTE Concert Orchestra, conducted by David Brophy. As always, Altan owns equally the tender Celtic ballads and the ripping sets of twin-fiddle Donegal joy, underpinned by precision backing and sparkling counterpoint. It’s just that now, they play them in the grand concert halls of the world for an elite, well-heeled fan base. That ain’t bad for folk music! VIDEO: Altan who plays a set from the balcony of the James Joyce Room of Bewley’s Cafe, on Grafton Street in Dublin.